Publishing your Workflow will make it live and all stages will be become active. This process is very similar to testing your Workflow. For more information on testing your Workflow, please read the following article. Select the 'Edit Settings' button. Select 'Live' from the dropdown that appears. The above screen will appear to confirm the Workflow has been published in Live mode. This means that all members will now progress through the Workflow and receive communications. 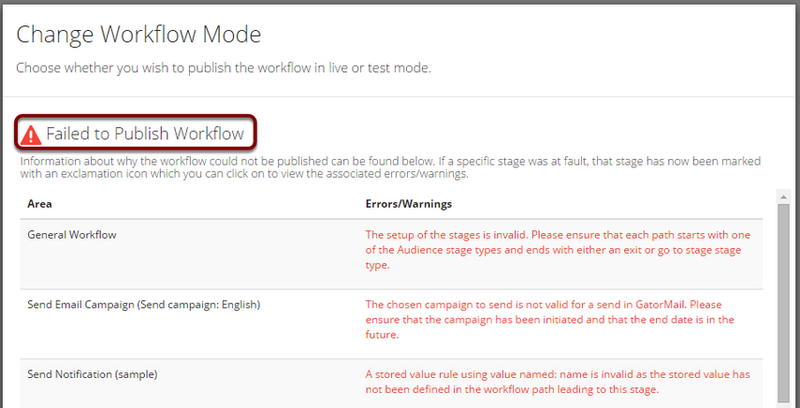 Should there be any errors in publishing the Workflow, you are presented with the areas that gave an error so you can rectify them and attempt to publish again. Should you receive any errors it is advisable to go through test mode prior to attempting live mode again. Once the Workflow is live, you can run through the analysis in order to see the stages that members access and complete. Select the 'Go To Analysis' button to access the analysis screen. The analysis screen will show a read only version of your Workflow and indicate the number of members that are active at, or have completed each stage. The Details pane shows information based on dates and number of members within the Workflow. Each stage will show the number of members that are currently within that stage and the number of members that have completed the stage and moved. Click on the number to see who the members are and interact with them. The Members tab will show you all of the members that exist within the Workflow. The log will show a history of all stage actions within the Workflow. The following actions are available for interacting with member records within a live Workflow. Click on the 'Actions' dropdown beside the member you would like to interact with. Remove Member - Removes the member from the Workflow, permanently. Remove Member (allowing re-entry) - Removes the member from the Workflow. Should the member meet Workflow entry requirements in the future, they will rejoin at that entry point. Pause Member - Pause the member at the current stage. You can resume them at any time in the future. Manage Stored Values - This will show you all of the Store Values for the member within the current Workflow. You are able to edit these at this point should you wish.